The Colangelo College of Business faculty just keeps adding to its list of awards. 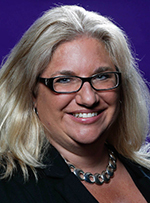 The latest to be honored was Dr. Donna DeMilia, who received the Ursel K. Albers Campus Advocate of the Year Award from the Institute of Management Accountants (IMA) for her work with the Accounting Society at Grand Canyon University. This comes on the heels of the GCU chapter being named the most outstanding last year. DeMilia estimates there are 300 IMA-affiliated chapters in the world. It also comes after Dr. Kelly Damron, another accounting instructor in CCOB, won the 2018 Region 7 Teaching Excellence Award for baccalaureate/graduate member institutions from the Accreditation Council of Business Schools & Programs (ACBSP). There also was Mark Jacobson, who received a 2017 Professor Recognition Award, a national honor from Vanguard, the investment-advice company. DeMilia has been at GCU since 2005, after teaching for 10 years at Mercy College in Dobbs Ferry, N.Y. She finds it interesting that her method of teaching has changed so much in that time. “When I started, I would lecture with chalk for four hours,” she said. “Now I teach for 20 minutes and do an activity for 20 minutes. 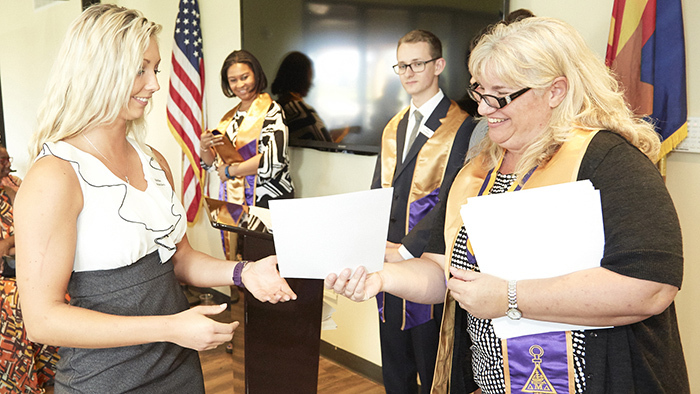 In addition to the Accounting Society, DeMilia also is a faculty advisor for GCU’s Eta Chi chapter in Delta Mu Delta, an international honor society for business programs. That duty includes organizing the annual Dr. Kevin McClean Research Colloquium, in addition to organizing the induction of new members and networking events.